The provincial government will quadruple its budget for anti-smoking programs this year and will focus on teenagers, especially girls. ``Statistics continue to show increasing smoking rates among teenage girls and higher death rates from lung cancer among women,'' provincial health minister Joy MacPhail said Monday at the start of National Non-Smoking Week. In announcing a 1996/97 budget of $2 million, representing a $1.5 million increase in spending on anti-smoking programs, MacPhail cited one survey that found 40 per cent of females aged 15 to 19 smoke. 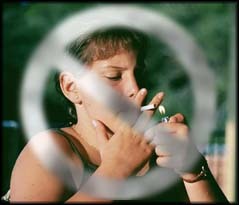 A 1994 Statistics Canada survey found 25 per cent of all teens in that age group smoke. While tobacco use has declined overall since the 1960s, more men than women have quit, so smoking-related deaths are rising faster among women than among men. According to the annual report by the provincial health officer, the number of smoking-related deaths among B.C. women increased from 1,480 in 1985 to more than 2,000 last year. MacPhail said much of the money to be spent on anti-smoking programs will be directed through non-profit organizations that share the province's tobacco reduction goals. ``We are embarking on a major project,'' MacPhail said in the offices of the Heart and Lung Foundation of B.C. and the Yukon. The foundation will collaborate with the government on a $550,000 demographic study designed to show such things as who smokes, why they smoke and where they live, so anti-smoking programs can be tailored to each community's needs. ``Without this information, we're casting a very broad net and we need to direct our efforts [on smoking prevention and cessation] more,'' she said. Meanwhile, MacPhail said teenaged decoys hired by the provincial government have helped convict 155 retailers who sold tobacco to customers under age 19. The tactic, in which 15- and 16-year-olds purchase cigarettes, then testify in court against the retailers, also led to 15 repeat offender retailers having their licences to sell tobacco suspended for a three-month period. The penalty on first conviction is usually $200, an amount MacPhail concedes is minimal but may be increased as the 10-month old enforcement phase of the province's anti-smoking program progresses. The enforcement measures are estimated to cost the province about $250,000 a year. According to the list of convicted retailers circulated to media outlets, the majority are small, neighborhood grocers. MacPhail said there are 6,500 retailers licensed to sell tobacco in the province, and she presumes big retailers are playing it safe because of the serious economic consequences of having their licences revoked. She said chain stores may also do a better job of informing their staff about the Tobacco Sales Act. MacPhail made a public plea for more informants to help convict retailers... ``I encourage the public to inform local health authorities whenever they are concerned about a particular vendor selling tobacco products to young people,'' she said. B.C. reportedly has the lowest rate of tobacco use in Canada at 26 per cent (the national average is 30 per cent) but smoking still kills more than 5,000 residents of the province annually and results in health costs estimated at about $1 billion each year. MacPhail said legal advisers to her ministry are still assessing whether the government should proceed with a lawsuit against tobacco companies she announced four months ago. The proposed action, to recover money spent treating smoking related illnesses such as lung cancer and heart disease, will proceed only if the advisers say the government has a good chance of winning, she said.